Posted by StrategicGrowth in local marketing strategies, marketing strategies, mobile, Mobile Marketing, Strategic Growth Concepts, The Mobile Marketing Review. As a member of ‘The Mobile Mavens’ on The Mobile Marketing Review, I am happy to say that the first broadcast of our show is now LIVE! And I think you’ll agree that it’s full of useful content and interesting insights from ‘The Mobile Mavens’, Kim Dushinski (author of The Mobile Marketing Handbook), Peggy Anne Salz (publisher of the Top 50 technology blog, mSearchGroove), and myself, Linda Daichendt (CEO, Strategic Growth Concepts; Founder, Mobile Technology Association of Michigan; and Co-founder, Mobile Monday Michigan). The show begins with our ‘Under the Radar’ segment which will be a standard part of every broadcast. In this show’s ‘Under the Radar’ we explore a recent Mobile study by Adobe entitled, Adobe Mobile Experience Survey: What Users Want from Media, Finance, Travel & Shopping which was published earlier this month. The Adobe study contains some interesting findings, but what really drew my attention was the final conclusion and recommendation, “As the pace of smartphone adoption quickens globally, businesses have to be invested in the channel and move beyond the planning stages to start executing and gain some learnings on how users are interacting with the mobile channel.” My take on that, “it’s time to get out of the kiddie pool, and jump into the ocean and start swimming!” The bottom line is, you can study Mobile Marketing all you want, and you can read every expert opinion you can find, but you’re never going to figure out how it really works until you start implementing a campaign! Sure, your business may make some mistakes – just like you’ve probably done with every other medium you’ve ever used. But every time you use it, you’ll do it with a bit more insight, a bit more education; and therefore, each time you do it, it will be more successful. And that’s what the company who produced our first evaluated Mobile campaign found out! We explored a North American campaign by Arby’s which promoted their RoastBurger sandwich. The company’s goal in implementing this first campaign was to develop local databases that could be used by their individual franchises for re-marketing efforts going forward. Our research indicated that they incorporated TV, print, public relations, and in-store signage / collateral. This first effort helped them build 172 local databases as a result of 89%+ response rates to the various media. Now, the local markets are taking advantage of those Mobile databases to continue Mobile Marketing efforts in their communities. The Arby’s campaign appeared to be well-thought-out and fully-integrated into an overall marketing strategy for the chain – signs of a firm doing Mobile Marketing the “right” way. However, the power of Mobile Marketing will really shine thru once the medium is fully embraced by small businesses. It’s all well and good that the large chains and corporations are utilizing Mobile – and those firms always tend to be the early adopters – but the story is yet to be written with regard to small business. I, for one, am quite confident that small businesses who learn the proper way to engage in Mobile Marketing will find it an extremely valuable, cost-effective tool for marketing their businesses. To showcase that, we at The Mobile Marketing Review are anxious to review campaigns on the show that have been submitted by small businesses and/or the mobile platforms they utilized to implement their campaigns. Therefore, we encourage firms that have taken their ‘first stab’ at Mobile to go to our website and submit their campaign information to us. Give us the opportunity to review your campaign so that we can help you, and other small businesses, improve the benefits you obtain from using Mobile Marketing. And since my fellow ‘Mobile Mavens’ and I have all discovered a shared affinity for Star Trek (and we wonder if that has anything to do with our shared love of Mobile Technology! ), I’ll close with a wish for all who follow this blog and will be following The Mobile Marketing Review that is a greeting from Star Trek, “Live long and prosper” in growing your business with Mobile! Posted by StrategicGrowth in local marketing strategies, marketing strategies, mobile, Strategic Growth Concepts. ANN ARBOR, MI – The Michigan Chapter of Mobile Monday today announced the speakers and topics for its upcoming monthly meeting. The event will be held on Monday, August 16th from 6:30 – 8:00 p.m. at Ann Arbor SPARK located at 330 E. Liberty Street in Ann Arbor. Attendance at this event is Free, and those interested in attending may register at MobileMondayMichigan.org. Featured speaker for the event will be Melih Oztalay, CEO of Birmingham-based SmartFinds Internet Marketing, who will be speaking on the topic of “Why Geo-Marketing is Becoming Increasingly Important for Marketing Your Business, and How Mobile Helps You Achieve It”. Other speakers for the event will be Megan Crosbie, Marketing & Membership Coordinator at the Ann Arbor Chamber of Commerce who will be speaking about the Chamber’s mobile app, A2YChamber, and Linda Daichendt, CEO of Strategic Growth Concepts, who will discuss recent studies regarding consumer cell phone usage and cell phone operating system market penetration rates. In today’s marketplace, mobile marketing is being implemented by business owners and marketers from the smallest ‘mom & pop shop’ to the largest multi-national corporations. As the traditional marketing channels suffer various levels of decline, mobile marketing is experiencing triple-digit growth annually. Mr. Oztalay’s presentation on Geo-Marketing via Mobile will help businesses capitalize on this growth by providing more effective ways of using the technology to improve local marketing results; while Daichendt’s presentation will review mobile from the consumer’s perspective. For more information about this event, please contact Linda Daichendt at Linda@StrategicGrowthConcepts.com. MobileMonday (MoMo) is an open community of mobile industry visionaries, developers, influential individuals, and users fostering cooperation and cross-company business development through virtual and live networking events. The groups programs are designed to facilitate idea sharing, best practices development, trends identification, and Mobile Industry growth locally, regionally, nationally, and internationally. The Michigan Chapter executes on these objectives by delivering a balanced approach of business and technical content from within the Michigan business community, as well as beyond our State, in order to insure the Michigan community is made aware of developments taking place outside our area that can aid local businesses. Those interested in learning more about Mobile Monday – Michigan can find the group’s website at MobileMondayMichigan.com; and information about the International organization can be found at MobileMonday.net. 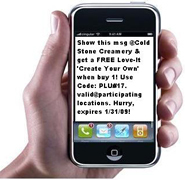 Using Mobile for Local Area Marketing (Part IV). In Part V we’re going to examine Mobile Marketing Etiquette and the Legalities involved in utilizing Mobile as part of your marketing strategy. As we review these two issues, you will begin to see how closely related they are in affecting the way in which a company implements a Mobile campaign. The person receiving the message must have already ‘opted-in’ to receive messages from you, therefore, they are receptive to receiving the messages you send them which will typically increase the message’s effectiveness. In order to insure that the best things about Mobile Marketing are not abused, it is imperative for companies utilizing Mobile to adhere to the guidelines and industry standards that have been developed and are strictly enforced. This information can be found in the M-SPAM Act of 2009 and the Mobile Marketing Association’s (MMA’s) Best Practices Guidelines. Adherence to these policies not only helps you avoid legal issues and huge fines, but it also helps you maintain the trust and loyalty of your customers. To help you understand the importance of this, let’s examine the cases of some companies who forgot. A 2009 article by Adam Broitman in iMedia Connection, details the case of a wireless carrier who forgot to follow the rules they helped draft. “Recently, AT&T sent out text messages to a large number of its 75 million customers. The message was a promotion for “American Idol,” a show that AT&T sponsors. (The company also plays a key role in the show, as only AT&T customers can vote for their favorite singers via text message.) Many of the mobile customers had not opted in to get this text, and the Twittersphere was, well, all atwitter! Sure, Twitter has been known, at times, to have a bit of a mob mentality. But in this case, it is apparent that these people were angry, and the ripples that began on Twitter created waves across the web.”, Broitman states. While legally AT&T was allowed to do what they did (the M-Spam Act allows carriers to send messages to their subscribers), they lost a great deal of trust from those subscribers who had never agreed to receive messages about American Idol from them and they probably lost a great many future subscribers who didn’t want to be subjected to such practices. “SPAM has all but killed email marketing, and has made the acceptance of mobile marketing more difficult to both the marketers, and the consumer. On a daily basis we have to win over customers, and explain that SMS and mobile marketing will not have the same problems as email. We explain how the carriers have control of what is sent over their networks, and about the MMA Code of Conduct. And then a reputable company comes along and does something stupid that sends us a step back. I just read a post on Greg Verdino’s marketing blog that just made me shake my head in wonder. Apparently Fast Company, a well known brand, took what could have been a great idea and ruined it for all of us. So I did, and immediately received a WAP push pointing to some good content that complemented the piece in the magazine. But here’s where it went wrong. I also received a text message informing me that I was now subscribed to Fast Company’s monthly mobile alert program. The problem is that neither the magazine sidebar nor the related webpage make any mention of the monthly subscription. And I simply wanted this month’s content, not an on-going mobile alerts subscription. One thing that we make clear to our customers is that if you are putting someone on a list, you must let them know. I’m not sure how Fast Company missed that. Just because someone sent in a text message to get the local weather, doesn’t mean you can send them offers and follow-up messages. Give the consumer a reason to opt-in and you have built a mutual relationship. Provide them something of value, and in return they will let you send them messages once in a while. Don’t just assume that because they requested something from you once that you can now contact them at your convenience. I should state for clarity’s sake that I was driven to explore this particular aspect of Mobile Marketing as part of this series as the result of a recent conversation with a business associate. We had a meeting where I was explaining the concept of Mobile Marketing, its value, and how it should be used. When I’d finished, my associate relayed to me a recent experience she’d had with a national retailer and their use of Mobile, it was not a positive experience. Apparently this national retailer had set up a program within their stores designed to obtain ‘opt-ins’ for their Mobile list. They had signage throughout the store offering customers an immediate purchase discount if they provided their cell number to be added to the chain’s ‘opt-in’ list. When my associate hesitated to give the number because the clerk could not provide clear information on how the phone number would be used, who would have access to it, what type of messages would be received, and how often, the clerk became quite agitated and said, “Well if you want the discount you have to give me the number, otherwise you don’t get it”. The store’s staff had not been educated about the details of the mobile campaign and was unable to answer the most basic customer questions about the promotion. The store’s clerk needed an education in appropriate customer service behavior; his response to my associate means that not only did the Mobile campaign not work as it was intended, but in fact it caused the chain significant harm as I know for certain that I am not the only person who heard the story from this individual (and we who heard it directly know the name of the retailer). I know for me personally, it’s unlikely I’ll be visiting them anytime soon, and I’m guessing others who have heard the story probably feel the same! So, the moral of the story is this, Mobile Marketing is an EXCEPTIONAL and effective method of marketing, however, it requires you to do your homework and plan the details of an effective marketing strategy. “Cross the T’s, dot the I’s”, and make sure you are adhering to the appropriate standards in implementing your Mobile campaign. And if you don’t feel confident of your ability to do it on your own, hire an expert to assist you. And then, sit back and reap the reward of a Mobile Marketing job well done! 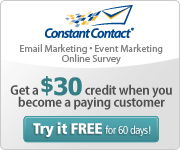 Posted by StrategicGrowth in marketing strategies, Mobile Marketing, Strategic Growth Concepts. In Part II of our series we discussed a variety of low-cost or no-cost methods of Mobile Marketing that a small business can utilize to promote their firm. In Part III, we’re going to take a look at a wide variety of case studies which showcase the way businesses are utilizing Mobile Marketing. Our example case studies are drawn from a wide variety of sources, and will detail Mobile Marketing strategies being implemented by firms both large and small; remember, Mobile Marketing is a great way for even the smallest of businesses to ‘level the playing field’. When opting in to your Mobile campaign, a consumer will have no way of knowing how many employees you have, what your store or office looks like, or how much inventory you’re carrying. The idea is to draw them in to want to visit your business. Mobile Marketing allows a small business to present itself in a professional manner, in a high-impact / high ROI medium, with a low cost of entry. What more could a small business want? In the case study examples we will provide, you will be able to see Mobile Marketing at work in a wide variety of business types including: retail, food service, travel, B2B, media/entertainment, healthcare, automotive, non-profit, real estate, consumer services, education, and much, much more. Many of the provided case studies go into great detail about the problem they were trying to solve, the mobile strategy they implemented, and the results they achieved. We encourage you to review them in-depth and consider how their examples might be applied to your business; and then we encourage you to SIMPLY TRY IT! There are a wide variety of Mobile Marketing resources that enable you to implement a single low-cost campaign without requiring a contract of any kind or any future costs; we would be happy to assist you in identifying those vendors. So now, let’s get to the case studies! Please follow the link to the case studies, and we encourage you to add any thoughts or questions to the comments for this article; we will respond to each and every one that requests a response and we’d love to know what you think about the case study examples provided. The author, Linda Daichendt, is Founder, CEO and Managing Consultant at Strategic Growth Concepts, a consulting firm specializing in start-up, small and mid-sized businesses. Linda is a recognized small business marketing expert with 20+ years experience in a variety of industries including: wireless, retail, chemical distribution, residential and commercial contracting, automotive aftermarket, personal services, shopping center development/management, and entertainment facilities management. Linda is available for consultation and can be contacted at linda@StrategicGrowthConcepts.com. The company website can be viewed at www.StrategicGrowthConcepts.com. Posted by StrategicGrowth in mobile, Mobile Marketing, Social Media, Strategic Growth Concepts. The Internet Advertising Bureau (IAB) mobile council has produced a list of the top 10 things it believes markets absolutely have to know about mobile advertising at the moment. It follows research from the IAB and PriceWaterhouseCoopers that mobile advertising is set to become part of the mainstream marketing mix over the next two years. It’s an always on medium: Consumers love their mobile phones so much that researchers found when they took peoples phones away for a day they claimed to feel a phantom ‘tingle’ in their pocket that normally proceeds the excitement of a text/call. Stephen Upstone, managing director of European business development, AdInfuse. Social media is driving growth: IAB research in 2009 found that updating social network sites via mobile handsets is increasing with 25% of all social networkers logging on to check or update their pages. 16 to 24 year olds are the biggest mobile social network fans with 44% saying they have updated via mobile, compared to 17% of over 55s. Amy Kean, senior PR and marketing manager, IAB. It provides immediate interaction: Mobile phones allow the consumers to interact immediately with advertising. Upon seeing an advert the consumer can text, call or download content instantly. It can help maximise the effectiveness of other media, a short code is a great example of this. Rachel Wright, business development director, Phonevalley. It’s got a lot to offer: Mobile Marketing is much more than banner adverts within internet content; a wide range of formats can be delivered as campaign components from text links in SMS messages through to full screen static or video display adverts within applications or mobile internet sites. Jeremy Copp, CEO, Rapid Mobile Media. Application crazy: iPhone users have downloaded over 1 billion applications worldwide to their handset since launch. Applications are not restricted to iPhone however; advertisers can create useful applications for consumers for the majority of handsets. David Fieldhouse, mobile manager, MediaCom. Smartening up: Over the last 18 months the number of UK Smartphone users (iPhone, Nokia N96, T-Mobile G1 etc) has grown from 3.6m subscribers to 6.3m, a 73% increase, and these users are over three times more likely to browse for News and Information on their phones than non Smartphone users (Comscore/MMetrics). Tim Hussain, head of mobile advertising, Sky. It’s out of your hands: If you’re not sure if your brand should be on mobile, consumers have already made the choice for you. 0ver 4 million consumers are already using their mobiles to search for information on products and services and search volumes are growing 4 times faster than online. Jon Mew, head of mobile, IAB. It can reach you: Target through to point of purchase – no other medium allows such precise targeting, from location based services like local search through to in-store Bluetooth marketing you can reach consumers wherever they are and provide relevant and engaging advertising. Paul Lyonette, head of mobile advertising, Microsoft. Consumers like Mobile! The Orange Exposure study shows 70% of mobile media users find innovative ad formats appealing. In an ad funded games trial 89% said they liked or were neutral to advertisements appearing on the Orange World portal and 88% said they were happy to be exposed to advertising in exchange for free or discounted content. Alex Kozloff, media research manager, Orange. NOTE FROM STRATEGIC GROWTH: Worldwide sales of smartphones increased 24% to 172.4 million units in 2009 according to Gartner, Inc. In the fourth quarter of 2009 alone, smartphone sales surged 41% from the year-earlier period to 53.8 million devices. The proportion of adult U.S. subscribers owning smartphones jumped to 17% last year from 11% in 2008 and 7% in 2007, according to new data from Forrester Research. The number of total mobile phone subscriptions worldwide has reached 4.6 billion and is expected to increase to five billion in 2010, according to the U.N. telecommunications agency. Posted by StrategicGrowth in marketing strategies, Strategic Growth Concepts, Virtual Technology.